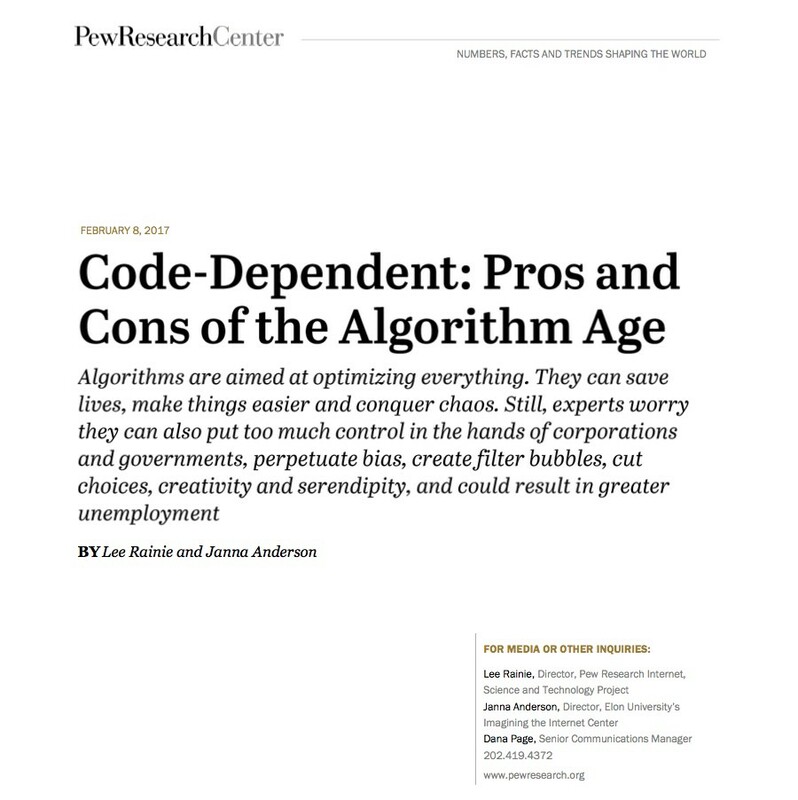 The publication of a Pew Research Center report entitled “Code-dependent: pros and cons of the algorithm age” (pdf), which includes the views of 1,300 technology experts, academics, policy makers and political leaders on the future of algorithms and their impact on society, gives me an opportunity to comment once again on a recurring theme: the growing importance of algorithms and the need to understand their design, operation and implications from a variety of perspectives. Increasingly, permanently evolving algorithms decide the results of our online searches, the news we read on social networks converted into media, the products we are offered in virtual supermarkets, and even who we find to sleep with on contacts sites or apps. The 85-page report, filled with quotations, offers many interesting points of view: algorithms are not only going to spread into more and more areas and regulate more and more aspects of our lives, but can also help us carry out more and more of these tasks as we rely on systems whose results improve as we feed them with more data. Algorithms are now capable of acquiring biases, of generating divisions or increasing existing ones according to criteria that should be checked and that increase the need for transparency and better understanding of how they work. Algorithms were originally designed by people who just wanted them to carry out some task efficiently, providing a competitive advantage over traditional ways of carrying them out. They also created search engines, social networks, shop or service contacts that respond to the mass processing of user data based on black box mechanisms that affect what we do in ways we never imagined. Spend some time clicking on search results that reflect a particular political slant and you may find that the browser builds a bubble for you that conditions your world view and reduces your exposure to other ideas … not dissimilar to what happened when you made the decision to read a particular newspaper or watch a particular television network. That said, we have always been dominated by algorithms: religions, which form an inseparable part of the history of mankind and still govern significant aspects of the habits and existence of millions of people, are no more than a set of algorithms designed to regulate certain behaviors. Now we find that many of these behavior patterns, rather than being regulated by a sacred text, are instead regulated by the calculations of a machine on the basis of our actions and those of others. When we talk about algorithms as the new gods, we are not so far off. We find ourselves at a very interesting moment, where experts meet and make declarations of ethical principles, present reports and feed ideas about what the future can bring us if we project what is emerging toward infinity and beyond. A foundational moment, with and infinity of players and lower entry barriers, ready for those with interesting ideas to elaborate new tools. But this is also a moment that shows the need to ready ourselves, to learn and to understand the implications of what is coming: program or be programmed. Either you try to understand algorithms and their consequences, or give up an important part of your ability to choose freely. But this isn’t just about learning to program. This goes much further and is about fundamental ethical implications, foundations rooted in the humanities, in philosophy, in the experience of thousands of years of human civilization and in a perspective that allows us to understand where we are heading. Without that, we will just be carried along by the tide.